As the Space Shuttle Atlantis prepares to return back to earth there is reason to celebrate the work done by the crew of STS-125. After five spacewalks totaling nearly thirty-seven hours the Hubble upgrade has by all accounts been an overwhelming success. The mission that put two of NASA’s aging workhorses in the spotlight demonstrated that neither was past their prime, but while one enjoys the broad support of the public and the Congress for its amazing photos of the universe the other after two tragedies and the lost of fourteen astronauts gets only selected political support and moderate public support. The Hubble is getting a new lease on life and is expected to perform at least another five years maybe just long enough to celebrate its 25th anniversary while the Shuttle is facing an early retirement in 2010 just short of its 30th anniversary. It seemed for a while that time had caught up with these scientific and mechanical wonders, but like an aging, champion prizefighter both showed they had one more fight left in them to win, and win they did. The work to repair Hubble showcases NASA at its very best. Extending the life of the space telescope included upgrading parts that were never meant to be serviced. This required new tools and flawless execution once the actual work began in space. Despite obstacles like parts that wouldn’t exactly fit and bolts that were locked in place after sitting in the extremes of space for nineteen years the crew managed to overcome these challenges and give new life to the Hubble, but amidst the joy of success there is also an element of sadness to this mission. This is both the last servicing mission to the Hubble and the last great Space Shuttle mission. 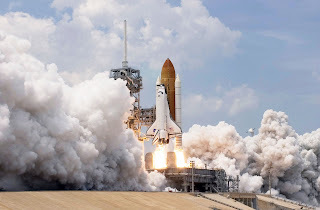 This particular mission more than any other previous Space Shuttle mission highlighted what NASA, the Space Shuttle and its highly trained and capable crew can accomplish working in space. It is fitting in a way that this great mission comes near the end of the Shuttle’s working life. A great example of what the Shuttle can do if given the chance and the right mission. It took a vehicle with the Shuttle’s unique capability to pull off this mission. One that could capture and hold the Hubble while it was serviced and one that could carry the parts, tools and crew to accomplish the tasks. The new Orion capsule will have no such ability to perform missions of this kind. It will be a “ferry” more than a “shuttle”. Ferrying people to and from the space station and perhaps the moon, but the true capability that is the Space Shuttle ends with this mission. Yes, we have a few more Shuttle missions to go and the delivery of the remaining modules to the International Space Station could have been done in an automated manner by unmanned rockets for it didn’t need the Shuttle to make that possible, but having the Shuttle made it easier. On this mission there was no substitute for what the Shuttle and the Astronauts accomplished. It wasn’t that long ago when a manned Shuttle mission to service Hubble seemed out of the question and sending a robot to perform the maintenance was seen as a possibility. While that may have been realistic on an object designed to be easily accessed and serviced by such a mechanism this mission proved that only humans could have performed this type of delicate work, Only humans could improvise on the fly assessing and recommending workarounds when unforeseen challenges arose. It is a capability we will miss and one that was underutilized during the life of the Shuttle. For a large part of the Shuttle’s life it had no place to go it was its “own destination” as a recent documentary put it. During the Shuttle’s life we missed out on so much of its potential and now as it prepares to the exit the stage it will be the Shuttle itself we will miss. 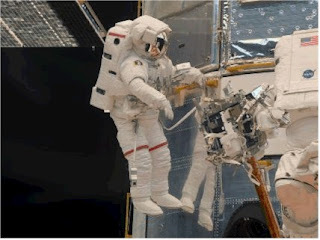 STS-125 Commander Scott Altman quoted a line from the movie “300” in complementing Mike Massimino and Mike Good on their success during one of their spacewalks “Remember this day, men, for it will be yours for all time”. Indeed we should remember these days of the last great Space Shuttle mission until such time that another great space endeavor will join its ranks. We can only hope that our wait for the next great moment in manned space isn’t too far off. Congratulations to NASA and the entire crew of STS-125, Spacewalkers and repairman extraordinaire Michael J. Massimino and Michael T. Good, Commander Scott D. Altman, Pilot Gregory C. Johnson, and Mission Specialists K. Megan McArthur, John M. Grunsfeld and Andrew J. Feustel for a job well done.